I absolutely loved Kar Wai Wong's The Grandmaster. It is a subtle and rare film that is a meticulously made period piece which looks absolutely magnificent, recalling both film noir and the marvellous sumptuous epics of Hollywood's golden era. Very much in line with Kar Wai Wong previous films. But this time there is lots of spectacular Kung Fu fighting thrown in. Respected action choreographer Yuen Wo Ping the guy behind the fight scenes in The Matrix, Kill Bill and Crouching Tiger, Hidden Dragon choreographed the action and the lead actors; Tony Leung, Ziyi Zhang and Chang Chen all undertook several years of rigorous and challenging Kung Fu training, with that kind of dedication you know the action is going to be well above expectations. Before seeing The Grandmaster all I really knew is that it was a film about Ip Man (First name - Man, Family name - Yip or Ip as in the East it is customary to give family name first), the martial arts master that taught Bruce Lee and has several films and a TV series made about him, that it was set to the backdrop of political upheaval in China. The trailer hinted at a gorgeous epic style Kung Fu film and that the American release was cut differently from the original Chinese version. Subsequently I have found out there are actually three different versions of the film. But what I was not expecting The Grandmaster to be as beautiful and as spirituality fulfilling tale of the times, lost values and as fitting tribute to the man. I can not verbalise with sufficient proficiency as to how moved I was by the story of The Grandmaster. Its an incredibly well made and subtle film of a land and people in turmoil. It is a gorgeously shot film and I would struggle to think of another film that is as well composed in recent times. The version of the The Grandmaster I saw was I assume a standard definition streamed version of the film with security watermarks all over it and even that did nothing to take away from how beautifully shot The Grandmaster is. It truly is a special film merging martial arts action with a seemingly timeless classic tale of a noble man whose life is thrown into flux and how he deals with it - is the real crux of the story, or that's what it was about for me anyway. I have always felt that there was an imbalance when it comes to martial arts films. You see I grew up in the giant shadow of the myth of Bruce Lee. I had the posters, the books, the paraphernalia. For me Bruce Lee was was part legend, part myth, part superhuman but always more than just a man. Later in life when I got to see one of his films I was, well, disappointed. I had always envisioned Bruce Lee as the manifestation of a heightened spirituality and physical perfection but his earlier films didn't seem to quite live up to those ideals. And although his films were always about the reluctant fighter forced into a fight to save others - the principles and spirituality of the martial arts seemed to play second fiddle or never really brought to light in his films, in favour of the more relatable average joe surprising everyone by fighting his way out of seemingly insurmountable challenges, that is maybe until Enter The Dragon. Bruce Lee was phenomenally popular and his films became huge hits in both the East and The West something never achieved before. In the East his first film Big Boss became the highest grossing film of the time knocking Robert Wise's The Sound of Music off the top spot. The point here being Bruce Lee was as much a cultural icon as a star and although not the first to present the tropes and themes in his films, he became the foremost proponent of Eastern Cinema and a certain style of filmmaking. Sadly his overwhelming popularity meant that Lee's style of films heavily influenced anyone else wishing to bring martial arts and similarly action to the screen. Widening the division between the spirituality of the martial arts craft and eye candy action leaving only hints at the deeper meaning beneath the disciplines. Don't get me wrong I'll still pay to see many, many of those films and enjoy some of them further perpetuating the problem. Part Two: Once again the teacher schools the student. Thankfully there seems to be an air of change about. As of late we have been getting more martial arts films where spirituality is either alluded to like in Gareth Evans' The Raid or in films where the focus has shifted a little away from the conflict to encompass more of the ideals and philosophy, most notably Yimou Zhang's brilliant Oscar nominated actionfest - Hero starring Jet Li and Tony Chiu Wai Leung or Tony Leung star of The Grandmaster. Unsurprisingly Hero became the highest grossing motion picture in Chinese film history and as with The Grandmaster was championed in the West by The Weinstein Brothers (Miramax) and presented by Quentin Tarantino. If you still haven't seen Hero I do recommend it as an outstanding example of modern Eastern Cinema, even though the CGI spectacle is a little exhausting. Told over two halves Spring and Winter. 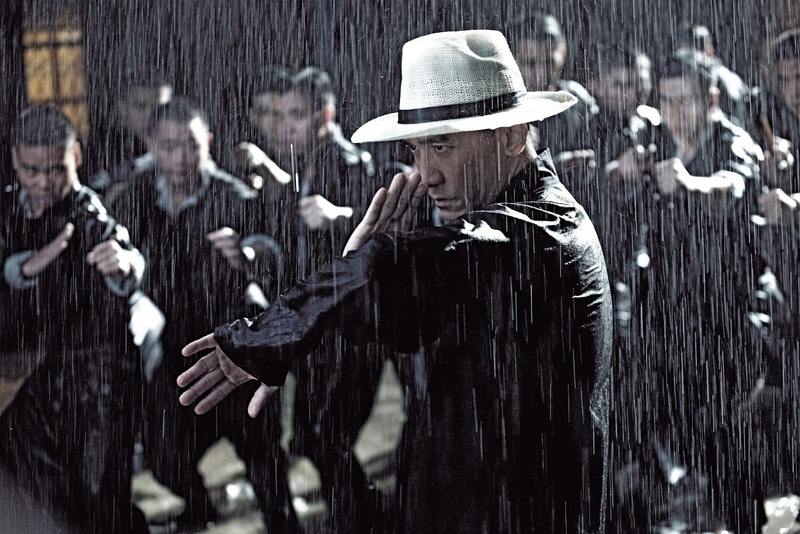 The Grandmaster is set in in the south of China in a time where each territory would practise their own style of martial arts and would regularly fight or compete against each other for pride, politics or resources. But the regions would unite into a North South divide with the strongest side ruling the other. 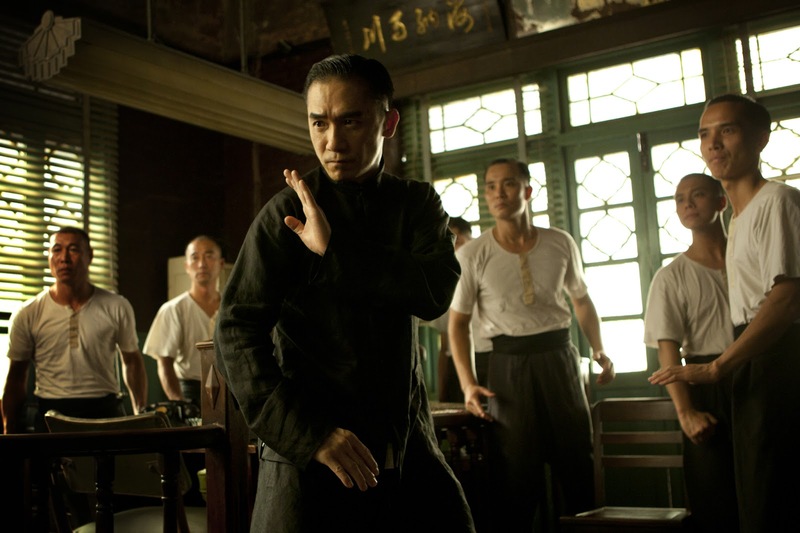 During the 30s Ip Man (Tony Leung) leads a charmed life in the south. With his beautiful wife (Song Hye Kyo) and young family. Born into wealth Ip Man has been able to dedicate his life to Wing Chun or Eternal Springtime his style of Wushu fighting and become a respected and well known warrior. He is chosen to represent the South against Grandmaster Gong Baosen (Wang Qingxiang) champion a fierce fighter Ma San (Zhang Jin). The challenge also marks the retiring of the old Grandmaster and naming of his heir and replacement, It is this event which is the catalyst and reveals surprises as to the true nature of Ip Man, but also sets off a chain of events that leads into the darker Winter part of the story where under the Japanese occupation of China Ip Man life is irrevocably changed. Too be honest, that to me was one of the most compelling things about The Grandmaster, Tony Leung's subtle portrayal of a man with immense power at his fingertips but chooses not to abuse that power, and despite his flaws and the increasing pressure on him he is never corrupted and is true to his chosen path of honour. I felt that this ethos was apparent in the type of storytelling that Kar Wai Wong adopts for The Grandmaster its a Kung Fu film called The Grandmaster about a skilled warrior but its actually a film about almost everything else and how Ip Man lives through turbulent times and stays true to his path, never yielding or debasing himself by following what could be an easier path of vengeance savagery or destruction. I would be remiss if I did not broach the subject of the three different versions as it has become a point of discussion. I was fortunate enough to have a chat with Philippe Le Sourd the Cinematographer of The Grandmaster and he felt that the original version was even more philosophical, as well as much more, which you can read about when I post my chat with him soon..
As I mentioned before the roll out of the narrative parallels the theme of Ip Man's story and particularly his place in history. I absolutely loved it. There did seem to be characters that had more background which we don't see - but for me knowing that there is more to them than is shown was part of the greater experience and very much like life - we don't know everything about a person when meeting them. If anything I'm comfortable knowing that there is another version of the film out there that I may or may not enjoy as much as this version, so I have that hopeful joy to look forward to. And I don't think one can make a comparative call on which cut is "better" without seeing both of them but I certainly don't think your viewing pleasure will be in any way diminished, bear in mind I have not seen any of the other versions. As The Grandmaster is indeed a Kung Fu film but rather than just a tool for resolving conflict another inner side of martial arts is shown the side that gives you the measure of a person's quality and depth and if sufficient the title Grandmaster is earned. It is definitely not a Kung Fu film with a character called Ip Man in it. It is the story of great man with Kung Fu in it. In 1936, China is experiencing political turbulence and the threat of division. The Japanese have invaded the northeastern provinces collectively known as Manchuria. Grandmaster Gong Baosen (Wang Qingxiang), whose home is in Japanese-occupied Manchura,and who is the leader of the martial arts world of Northern China, arrives in Foshan. He had been to Foshan previously to initiate exchanges between the martial artists of the North and those of the South but this time he has come at the invitation of the Southern masters to hold a ceremony at the Gold Pavilion to celebrate his impending retirement.